The clarity of President Akufo-Addo’s campaign message might have endeared him to many voters, leading to his ‘sweat’ victory. His message was shipshape and Bristol fashion. We still remember ‘Free SHS’, and ‘One District, One Factory’. The fight against corruption was also one of the centerpiece of the president’s message. President Akufo-Addo was candid and emphatic: “my government will fight corruption.” His resolve to fight almighty corruption – Ghana’s ‘terrorism’ that’s killing thousands of citizens in silence – resonated with many Ghanaians. It was very assuring and seemed timely because this was the time that corruption was perceived to be widespread and pervasive - many Ghanaians felt corruption had reached rambling levels. And there was a certain Mr. Martin Amidu who was a bastion of transparency and accountability. He was nicknamed the ‘Citizen Vigilante’, because he was well noted for his no-nonsense approach to corruption. Mr. Amidu and the NDC were therefore, like apples and oranges on corruption issues – “their eyes didn’t meet” at all! 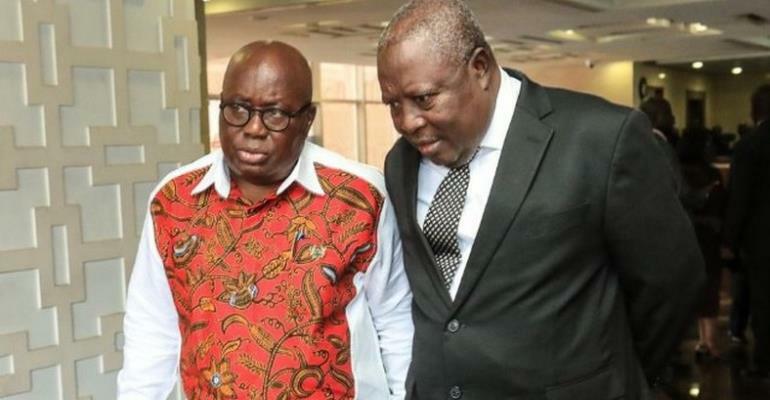 Besides having to deal with the opposition NPP at the time, Mr. Amidu became one of the NDC’s main bugbear – he was a constant nightmare, an incurable pain in their neck (it served them right because the corruption was too much). Many Ghanaians admired the Citizen Vigilante for his firmness and constancy to his country. After all, he wasn’t a running dog, a rubber stamp who will be at the beck and call of his party (this is what true democracy should represent, so that there are intelligent politicians who can question the credibility and soundness of their own party’s policies and practices). Mr. Amidu suffered blistering verbal attacks form his party, but that wouldn’t let him budge. So that’s a bit about Mr. Amidu’s anti-corruption campaign. And now back to President’s Akufo-Addo’s campaign message to fight corruption. In fulfilment of a major campaign promise, the Office of the Special Prosecutor was set up much to the delight of Ghanaians and anti-corruption campaigners. Of course, this represented a significant milestone in efforts at combatting ‘unsurmountable’ corruption in the country. Then who occupies this crucial role became the next hurdle to clear and Ghanaians waited with bated breath. The nomination of Mr. Amidu as the Special Prosecutor sent almost the entire country into wild jubilation – it sounded like the Black Stars scoring a goal at the world cup. Because we all knew Mr. Amidu and what he stood for. He was a household name for anti-corruption campaign. He therefore, received overwhelming support from the public with many citing his integrity as the most important attribute. Mr. Amidu’s nomination even sent shivers down the spine of some members of the opposition party who went all out to block his appointment, but to no avail. But so far, both the Special Prosecutor and President Akufo-Addo’s responses to corruption CASES (not allegations) raise serious concerns about the government’s promise to stamp out corruption. The president’s approach of fighting corruption looks more like: “let me throw dust into their eyes as if I’m fighting corruption.” Let me give you just two examples to buttress this. The second example is the humongous Anas' Expose (Number12) on Ghana Football. Following the harrowing revelations, the president made an impetuous call for the arrest of the ‘Middleman’. After that, case die. But let me remind the president that the evidence that FIFA used to ban Kwesi Nyantakyi for life and imposed that hefty fine on him less than six months after the Anas’ expose, Ghana has the same evidence or even better since the evidence was originated by a son of this country. Mr. President, what are you waiting for? I hope you now get a gist of my “let me throw dust into their eyes as if I’m fighting corruption approach”? Clearly, it seems Nana Akufo-Addo has changed his tune on corruption fight when he ascended the presidency. His avowed intent are belied by his approach to fighting corruption. The much talked about Office of the Special Prosecutor has also been counter-intuitive. Disappointingly, it has been more than a year since Mr. Amidu was appointed as the Special Prosecutor, but no show! This is indeed surprising – with all Mr. Amidu’s anti-corruption accolades and track record! Mr. Amidu has been complaining about buckets of challenges that are hindering him from functioning effectively. This boggles my mind! Knowing Mr. Amidu as vociferous and principled man when it comes to corruption, did President Akufo-Addo deliberately create the Office of the Special Prosecutor to ‘corner’ Mr. Amidu in order to muzzle him on corruption of the day? That sounds a canny move! I believe Mr. Amidu would have been very critical of the president’s style of fighting corruption if he were not the special prosecutor. Or is it more of a poacher turned gamekeeper? Now my piece of suggestion to Mr. Amidu. Citizen Vigilante (is this still your name? ), may be you haven’t noticed it, but your special prosecutor job is unflattering your enviable trademark and credentials as a revered corruption fighter. Respectfully, if you feel frustrated or feel your work is being impeded that’s not making you effective, kindly resign and animate your Citizen Vigilante work. For your information, discussions are underway to disband political vigilante groups in Ghana. What this means is that the ‘Martin Amidu Vigilantism’ will be the only recognised group if you revive it now! Think about this Mr. Amidu if you want to restore confidence in your army of admirers. If you choose to ignore this suggestion and unproductively make merry in your special prosecutor job, posterity will judge you for haunting the NDC and conniving with the NPP to rob this nation. We miss your Epistles anyway! The writer is a development practitioner, human rights and anti-corruption campaigner.